Richard Hussey Vivian appears in this portrait, from a painting in the Exeter Museum, in the uniform of a General officer of Hussars. The jacket and breeches are scarlet, decorated with gold lace and braid, while the pelisse is blue and gold and the boots are of yellow leather. He holds his brown fur busby in his left hand. Vivian's first campaign was as an infantry officer in Flanders in 1794 where he was with Lord Moira's reinforcements. He was at Nimeguen, Thiel and Geulder Malsen. He took part in the Helder campaign, sailing from Deal on 13th Aug 1799. He was under the command of Sir Ralph Abercromby and attended the battles of Bergen and Alkmaar. 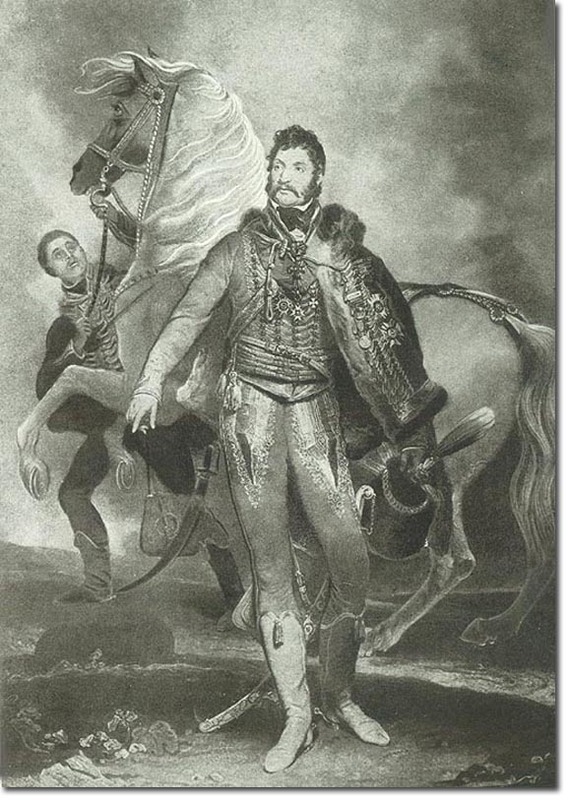 In 1808 he commanded the 7th Hussars in the initial disastrous Peninsula campaign which ended in the retreat to Corunna. At the beginning of the campaign he met with senior French officers whose superb uniforms impressed him greatly. His preference for flamboyant hussar dress must have been influenced by this. Vivian wrote of his experiences throughout his military career, of the constant rearguard actions of his cavalry regiment, and gives a harrowing account of the suffering experienced by the soldiers during the terrible journey to Corunna. He also commanded a cavalry brigade in the later part of the Peninsula War, at Olite, Nivelle, the passage of the Nive, St Pierre, Gave de Pau, Orthes, and on the height of St Boes. He entered Bordeaux on 12th March 1814 and joined Wellington's advance on Toulouse. He led a brave cavalry charge of the 18th Hussars and 2nd KGL on a larger body of French cavalry at Croix d'Orade, taking 100 prisoners and sustaining a bad wound. Following this the 18th presented him with a sword of honour. He was at Waterloo and received more honours after the battle, including a knighthood. He reached the rank of Lieutenant-General, and was made Lord Vivian a year before his death in 1842. 1842 Died in Baden-Baden Aug 20th. Buried at Truro.